Whoopi Goldberg shaves her eyebrows because she doesn't want them. But most of us actually like having eyebrows, spending time and money shaping them and coloring them. And when our eyebrows start to thin out, we want to grow them back. There are a number of reasons why eyebrows grow sparsely, have gaps in them, or seem to be disappearing. They can be affected by ill health, your genes, age, stress, or over-plucking. Unfortunately, in the quest for the perfect eyebrow shape, sometimes we get overzealous in removing hairs. But if the follicles are damaged, the eyebrows won’t grow back properly. Hence you’ll notice that your once-lush brows are looking thin. What is an eyebrow growth serum? An eyebrow growth serum is a product designed to encourage hair growth. Some people like to use eyelash growth serum on their eyebrows because some are advertised as working for both purposes. But some eyelash serums will discolor skin, so they are not a good choice for treating eyebrows. To help you safely grow your brows thicker and healthier, we selected a variety of eyebrow serums that encourage re-growth of hair with natural and clinically-tested ingredients. Now let's get down to the reviews of the best serums to restore eyebrows. Clinically proven to help more than 90% of its users to grow thicker eyebrows, the RevitaBrow serum is a top-selling product. Not only does it encourage new growth of eyebrow hairs, it protects them from breaking and becoming overly dry. It only needs one application per day to get results. The formula lists ingredients like peptides and botanical components that moisturize hair without irritating skin and eyes. For example, it contains biotin, green tea extract, and lipids, as well as calendula, panax ginseng, and swertia japonica. What do all these things do to regrow eyebrow hair? For one, the BioPeptin Complex of green tea, lipids, and biotin is basically a hair conditioner that keeps eyebrows healthy and strong. Calendula is a humectant that draws moisture into the individual hairs to protect them from becoming dry and brittle. And the last two herbal extracts contain anti-oxidants and Vitamin B that also protect and rejuvenate hair. Please note that the ingredients list also contains "Dechloro Dihydroxy Difluoro Ethylcloprostenolamide", another name for prostaglandin. RapidBrow serum also relies on peptides and botanical extracts to strengthen and revive thinning eyebrows. The ingredients list mentions hyaluronic acid, which is a moisturizer, keratin and panthenol to strengthen hair, as well as pumpkin seed extract, sea water, and sweet almond extract. The manufacturer suggests applying RapidBrow twice a day with the included mini-brush. If you do this, they say you’ll see a difference in 60 days or less. Believe it or not, celebrity eyebrow stylists actually exist. One of them happens to be Joey Healy, creator of this Brow Renovation Serum. Joey knows all about how to deal with over-plucked eyebrows. As a result, this formula is packed with ingredients that rejuvenate brow hair without nasty components like parabens or fragrances. For example, the ingredients consist of pentapeptides and proteins, Vitamins A, E, C, and B5, plus rose, eyebright, licorice, and white tea. This combination can grow thicker brow hair in only two to three weeks when applied morning and night. Do note that they recommend waiting 5 minutes for it to dry before applying makeup. The Boom Boom Brow Bar may have an entertaining name, but its Brow Job apparently gets results in 4 to 6 weeks if you apply it twice a day. It’s the same product that you can find in the Brow Bars of the same name in New York City. While the manufacturer explains that this product has been clinically tested and reviewed by an ophthalmologist, there is something important to note at the end of the ingredients list. The formula appears to contain both parabens and prostaglandin I.C. Prostaglandin I.C. may have side effects like skin irritation, eye irritation, brown rings around the eyes, and and darkening the eye’s iris. These side effects seem to affect people who use products with this ingredient to grow out their eyelashes. But do be very careful if you decide to try one on your eyebrows. Boom Boom Brow Bar recommends applying the Brow Job at least once per day, preferably at night. If you’re over 30 years old, you can apply it twice a day. One you brush it on in the morning, you only need to wait 1 minute before you apply makeup. Each tube of this serum is designed to last for one month, but it may take 4 to 6 weeks to see results. ArtNaturals’ Eyelash Growth Serum also works on eyebrows to grow them thicker and healthier. The ingredients list reveals myristoyl pentapeptide-17, clinically proven to be effective on both lashes and eyebrows. The formula also contains “Swiss apple stem cells,” that stimulate hair follicles to help hair grow in healthy and strong. Of course, like other ArtNaturals products, this one is cruelty-free and paraben-free. Organyc’s Eyebrow Growth Serum contains myristoyl pentapeptide-17, which has been clinically proven to regrow stronger lashes and brows. But it doesn’t have artificial dyes, fragrances, parabens, sulfates, phthalates, SLS, PEG, prostaglandins, or gluten, plus its vegan formula is cruelty-free. The manufacturer recommends applying the serum twice a day to both eyelashes and eyebrows. They offer a 100% refund if you don’t see results in 60 days or less. Ardell’s Brow and Lash Growth Accelerator uses protein and conditioning ingredients to revive brittle brow hairs immediately, then support new growth of hairs over the long term. Some of those proteins come from wheat, soy, and castor oil. In fact, castor oil is one of the natural remedies people use to re-grow their eyebrows. Here is one of the least expensive treatments you can use on your eyebrows. It’s castor oil that comes in a bottle with a pump dispenser for easy dosing. Read more about castor oil for eyebrow growth at the bottom of the page. If you buy a large container of castor oil, this kit from eBoot makes packaging it very easy. It includes an eyelash wand, a tube for your homemade castor oil “mascara,” and a tiny funnel to help you fill the bottle. 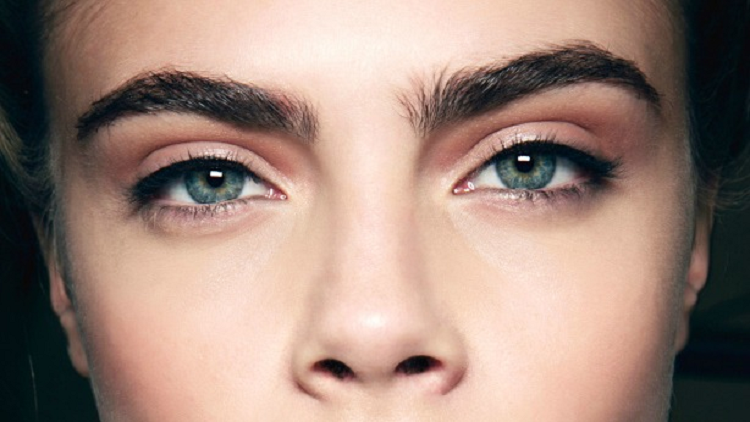 So you’re interested in thickening up those thinning brows? Applying one of the top eyebrow serums is a step in the right direction, but it’s not the only thing you can do. Some people have had success using simple natural ingredients to stimulate hair growth on their eyebrows. If you use a serum one time a day, either morning or night, brush on an oil like castor, coconut, or Vitamin E at the other end (or beginning) of the day. Exfoliating is also a good idea. Gently brush your brow line with a baby toothbrush. This gets rid of dead hairs and skin, plus it encourages blood circulation. Like any hair anywhere on your body, eyebrows can fall out due to illness, stress, medications, poor diet, and environmental factors. And sometimes people simply over-pluck them in an attempt to shape them. Whatever the reason, it may only be a temporary problem. Or if the hair follicles are damaged, your eyebrows may not grow back at all, or grow back sparsely. The very first step is to stop the damage. Don’t pluck, don’t thread, tweeze, wax…let those poor eyebrows rest. If you’ve been pulling them out because you’re nervous, find a way to stop. The next step is to take a deep breath and realize that it will take a while for your eyebrows to recover. If you’re impatient, look into salons that can brush on temporary brow filler. Or use a tinted brow gel to hide the gaps. Now, begin faithfully applying your serum. Gently exfoliate with a soft brush. If you’re not using serum twice a day, consider supplementing with a natural remedy like castor oil. And maybe even take a natural supplement for hair growth. While it seems that those unibrow hairs grow in unnaturally fast, be patient while the rest of your eyebrows catch up. Invest in a pair of glasses to disguise your brow line if needed. It’s going to take a few weeks to get back to normal. What ingredients speed up eyebrow growth? Lots of eyebrow serums list peptides on their labels. That’s because peptides speed up the anagen phase of hair growth right down at the follicle level. For example, myristoyl pentapeptide-17 was tested in private clinical trials and found to be effective. Other serums often contain keratin, which protects and strengthens hair, but doesn’t contribute to hair growth. But ingredients like vitamins, proteins, and moisturizers keep the hairs you have in top shape while new hair grows back. But do be careful if you choose a product that promises quick brow growth with prostaglandins. The FDA has warned some companies about including this drug in their cosmetic products since it should be prescription-only. Other names for this ingredient are Isopropanol Phenyl-hydroxy-pentene Dihydroxy-cyclopentyl-heptenate, bitamoprost, and Dechloro Dihydroxy Difluoro Ethylcloprostenolamide. There’s definitely hope for people who are frustrated with thinning eyebrows. Many will find that a top quality eyebrow growth serum will restore their brows to thickness in a couple of months. But after that, it’s still smart to continue to take good care of those lush eyebrows. To that end, most of the products we reviewed today don’t just stimulate hair growth, they also condition and moisturize the eyebrow hairs you already have. It could be worth your time to continue treating your brows to keep them strong in the future. And why not take care of those eyelashes, too? In conclusion, we hope you found the perfect eyebrow hair growth serum today. And if you have other concerns about hair loss, just take a look at our reviews of hair growth products.